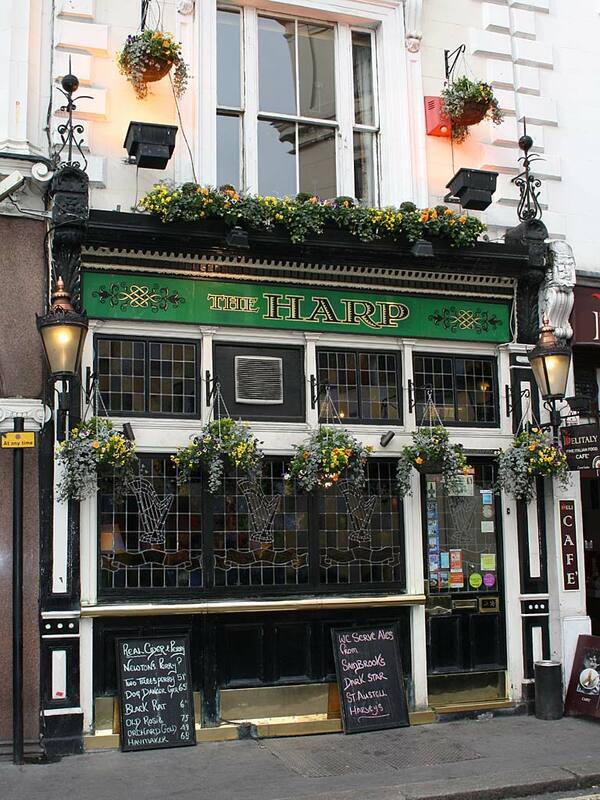 See more pictures of the Harp near Charing Cross. Years ago my relationship with the Harp got off to a shaky start when the beer quality was all over the place on my first visit. However I was attracted to the cosy atmosphere of this tiny standing-room-only pub and after another recommendation I decided to risk another encounter. Well it was fine and after a number of subsequent visits it seems as though the problems on my first trip were an aberration. The Harp is now one of my favourite London pubs. It has 8 handpumps which are always in operation. Harveys Sussex Best is a constant as are two or three Dark Star beers including the best Hophead you’ll drink anywhere. The remaining pumps are taken up with an eclectic selection from any number of breweries including Sambrooks, Twickenham Ales, Thornbridge etc etc. Deservedly the pub is the CAMRA Greater London Pub of the Year. Its popularity has soared and it can get very busy at lunchtimes and strainght after work. Try upstairs for a piece of peace and quiet but you’ll need to be lucky to get a table. Cider enthusiasts are well catered for at the Harp too – with usually 8 different real ciders available too. Food is limited to fine sausages from O’Hagans served in a baguette. Get one while you can as they sell out fast. Bridget who has been running the pub since the mid 90s can often be seen in the bar chatting to her customers. In 2009 she managed to buy the pub from Punch, and freed from their tight restrictions she has created a truly wonderful pub. So to summarise: Good pub with friendly, lively atmosphere. Well kept beers. Hardly any seats – except upstairs. The sausages are very good too. One of my favourite pubs in London. The pub was named CAMRA National Pub of the Year 2010/2011 – beating some strong finalists from other regions. I was invited to the presentation and you can my write up of the event here. 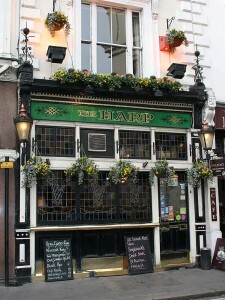 The Harp, Charing Cross has a website.